The Lucrehulk was originally designed as a large scale cargo vessel, supporting the massive commercial fleets of the Trade Federation. When war loomed over the horizon, the Lucrehulk was soon converted to fulfill military purposes: its huge, unparalleled structure padded with resistant armor and outfitted with numerous heavy lasers. The new armaments were placed on the outside arc of the behemoth to create a wider band of fire and enable its crew to defend their ship against hostile fighters and bombers from any angle. The lumbering giant, in the shape of a broken circle and slate gray in appearance, the Lucrehulk is a menacing sight on the battlefield looking as if it could engulf its enemies. Beyond its rugged looks, the ship's extensive armor, shielding, and weapons coverage make it almost invincible against fighters and bombers; unless they can break through to the central, spherical section of the ship, which hosts the bridge and main reactors. The Lucrehulk maximizes efficiency by minimizing organic personnel; it is operated almost entirely from a droid crew and each droid is programmed for its own specific job. The vessel contains several droid workshops, for inorganic repairs, with only a single medical room for the occasional organic treatment. During the Lucrehulk's conversion from a hauler, its cargo space, which spans the entire ship and are able to host thousands of fighters and bombers, were preserved, and enable it to swarm the battlespace with hundreds of attack squadrons in a short span of time. However, the Lucrehulk's lack of heavy turbolaser batteries make it weak against other capitals and it is often found surrounded by large warfleets. Though stored throughout the Lucrehulk while in transit, cargo is transferred and ships are launched from the docking bays located at the break in its ring. Also carrying-over from its days as an entirely commercial vessel, the Lucrehulk's mammoth docking claws work with its newly outfitted tractor beams to make it much easier to dock within the vessel, or much harder to escape it. Due to its history as a cargo vessel, the Lucrehulk is able to make a planetary landing, but rarely does, since most repairs can be made in orbit. 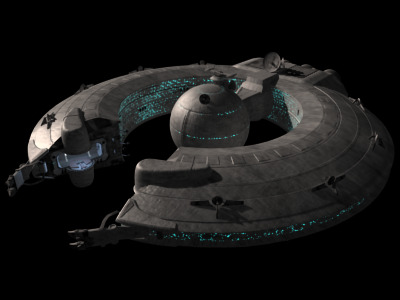 Pick-up and drop-off of goods and personnel from a planet's surface can be performed using smaller, quicker ships dispatched from the mammoth ship's belly. During war times, however, the landing capability provides a great advantage to the Lucrehulk's commanders, due to its capacity for hosting an entire invasion force. Additionally, the ship's armor and shielding gives its forces a higher survivability rate during the descent through the atmosphere than on dropships. Though it is aptly called a "lumbering behemoth," and reliant on somewhat outdated anti-starfighter weaponry, the battleship's targeting systems and vast docking bays, which can be equipped with nearly endless squadrons of fighters, give the Lucrehulk 3210 a lethal edge over its enemies.